Metro Garment Hanger Tubes are used for hanging clothing or any garment on the underside of your Metro Shelves. So they can be used on free standing shelving units or wall shelving. Hanger tube attaches easily under Super Erecta shelves for hanging garments. Available in 18″, 21″ and 24″ (457, 530 and 610mm) widths and in same length as shelves. Hanger tubes expand available storage space in almost any room of the home. Furthermore, they attach with ease to existing shelving to customize a closet and maximize organization. Bedroom: Hanger tubes turn a packed closet into one that’s neat and organized. Users easily see and find the clothing they need. Attic and basement: Tubes expand storage space for seasonal clothes and decorations. Laundry room: Extra hanging capacity allows users to hang dry and protect dress shirts, wool pants and other clothing from dryer shrinkage. Guest room: Visitors appreciate space to hang their clothing whether they stay for a few days or a few weeks. Office: Additional hanging space holds an emergency suit, jacket and umbrella. Garage: Sort and store rope, cleaning supplies and sports equipment off the floor. Installing spare hanging tubes is easy with included brackets and instructions. The hanger tubes also move quickly and easily to other shelving units as needed. Because they are versatile, hanger tubes allow many shelving units to operate more efficiently. They also turn almost any room of the house into one that’s capable of storing, sorting, protecting and organizing clothing and other hanging items. 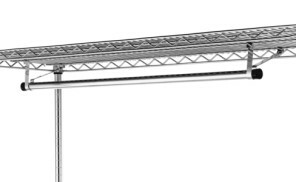 Hanger tube attaches easily under Super Erecta shelves for hanging garments. Available in 18", 21" and 24" (457, 530 and 610mm) widths and in same length as shelves. Bedroom: Hanger tubes turn a packed closet into one that's neat and organized. Users easily see and find the clothing they need. Installing spare hanging tubes is easy with included brackets and instructions. The hanger tubes also move quickly and easily to other shelving units as needed. Because they are versatile, hanger tubes allow many shelving units to operate more efficiently. They also turn almost any room of the house into one that's capable of storing, sorting, protecting and organizing clothing and other hanging items.